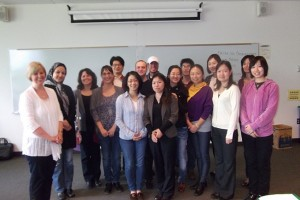 ON THE JOB COMMUNICATIONS is a class that is offered free to the ESL community living in Bellevue. Students will find a warm, welcome from the instructor, who invites students to attend, learn and develop their knowledge of communicating in the workplace. REQUIRED TEXBOOK: SEND ME A MESSAGE by Mackey, Daphne. (2004) (ISBN: 0-07-295351-9) McGraw Hill: NY. Available in the Bellevue College bookstore, and at online bookstores. Interested in working in a paid or volunteer job, in the U.S., now or in the near future. ESL level 6 (advanced level). Ready to attend all classes and complete all assignments. Willing to study one hour online each week. This is a requirement of the class. Edit and write business documents such as e-mail and letters. Make requests using formal and informal communications, direct and indirect language. Correct punctuation, capitalization and layout. Read business e-mails and letters, identifying mistakes. Read case studies about workplace situations and understand the main problem. Read a report and an agenda for a meeting. Participate actively in pair work, group work and as a whole class. Students will gain confidence asking questions, giving feedback and reading out loud. Leave a message in a formal, business situation. Share ideas, give opinions, and participate actively in a department meeting. Make a short presentation on a business related topic. Students will learn about structure and delivery of presentations.